Utagawa Kuniyoshi was one of the most talented and prolific disciples alongside Kunisada, of Toyokuni (1769-1825), the most revered master of the Utagawa School. While was Kunisada's forte was depiction of women and kabuki actors, Kuniyoshi excelled in both landscape and figures. 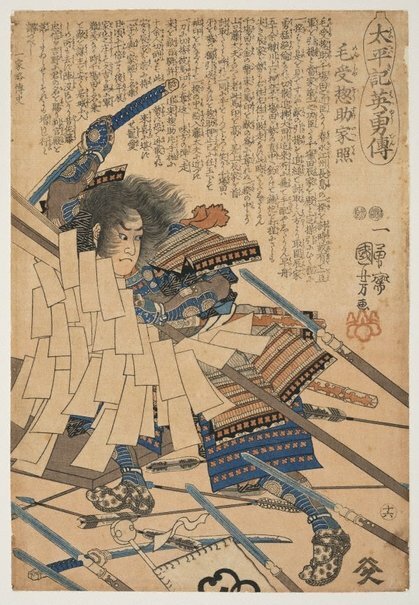 He was particularly known for his many series of warrior prints based on legends and popular literature. This 'Taiheiki' series was produced around 1850 at the time of Kuniyoshi's artistic maturity. Another famous series by him titled 'Seichû gishi den' (The tale of loyal retainers) was also published around this time. This series features 50 heroes from the 16th century wars, but the title 'Taiheiki' (Record of Great Peace) refers to a historical account of a civil war period in the 14th century. This is because the authorities prohibited publication of any historical subject since the time of Oda Nobunaga (1534-82) and the publisher 'got around' the censorship by setting the context in the earlier period as well as slightly changing the protagonists' names. The warriors in the series were considered heroes for their bravery in battle and loyalty to their lords. These stories were known to the public through popular literature and at theatre performances. Asian Art Dept., AGNSW, 29 May 2002. Signed c.r., in Japanese, ink, incised on block "Ichiyûsai Kuniyoshi ga [picture by Ichiyûsai Kuniyoshi]". Signed c.r., in Japanese, ink "[artist's seal]". Not dated.